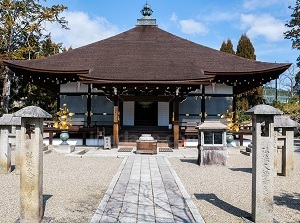 Nin'naji is the temple of a sect of Shingon Buddhism, one of major Japanese Buddhism schools. It is located about 0.7 km southwest of Ryoanji. 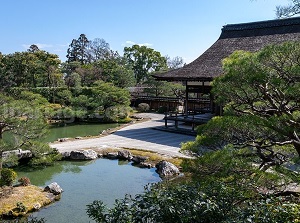 This temple is one of 17 constructions of "Historic Monuments of Ancient Kyoto" designated as a World Heritage Site. 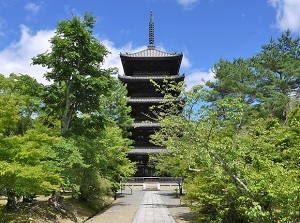 The construction of this temple was started in 886 by Emperor Koukou. But he died the following year, then the enthroned Emperor Uda completed the temple in 888. In 897, Emperor Uda ceded the throne to his son (Emperor Daigo), and he became a priest of Nin'naji. 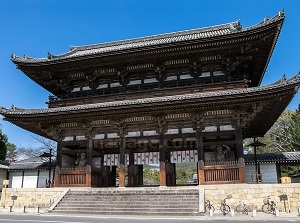 Since that, the chief priests of this temple had been the members of the imperial family until the 19th century. All of the buildings were destroyed by fire in 1467 by the civil war, then the buildings were rebuilt in the 1620-40s by Edo Governmnet. 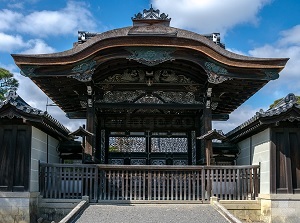 At that time, Kyoto Imperial Palace was also rebuilt, so some old buildings were moved and rebuilt in Nin'naji. In the precincts, there are several buildings. After passing through Niomon gate (South gate), we can see "Nin'naji-goten" (Nin'naji Palace) with some buildings and Japanese garden. It was the area where Emperor Uda lived, and is the current main temple. And in the north part of this temple, there are "Kondo" and "Goeido". Kondo is the moved former Shishinden palace in Kyoto Imperial Palace built in 1613, and is designated as a national treasure. 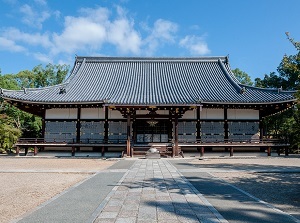 Goeido is the temple built with marerials used in the former Seiryoden palace in Kyoto Imperial Palace, and is designated as an important cultural property. Nin'naji has about 200 cherry trees. Their peak bloom period is around April 20th, and we enjoy the latest cherry-blossom viewing here in Kyoto. Cherry blossoms in Nin'naji are called as "Omuro-zakura". The pilgrimage of 88 temples in Shikoku Island has been famous since the Middle Ages. But it had been very difficult for common people to do it. So the chief priest of this temple set up the mini pilgrimage route to the north of this temple in 1827. Under each temple, the soil in the real temple with same name in Shikoku are lain. 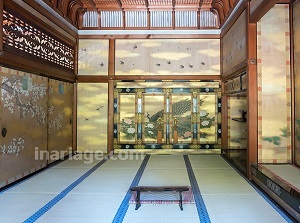 The admission fee to Nin'naji-goten is 500 yen. Also the admission fee to Reihoukan museum is 500 yen. 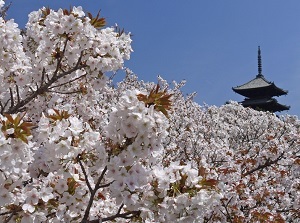 And in the season of Omuro-zakura (April), the admission fee to this temple (500 yen) is set up. From Kinkakuji-mae stop, about 7 minutes to Omuro-Ninnaji stop, by bus with route No. 59. By Randen (Kitano Line of Keifuku Electric Railroad), about 5 minutes from Kitano-Hakubaicho to Omuro-Ninnaji. Then about 2 minutes walk from there.